This week: Virgin Australia names new CEO; Hainan to open Dublin’s second link to China; Qantas officially cancels A380 order; Thomas Cook mulls airline sale; Hop! to be rebranded and more. A round-up of the latest news from the aviation industry this week. 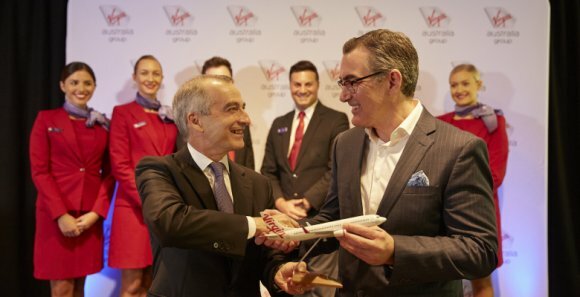 Virgin Australia has named Paul Scurrah as the successor to outgoing chief executive and managing director John Borghetti. Scurrah has held CEO roles at DP World Australia and Queensland Rail, as well as executive general management roles at Aurizon, Flight Centre and Tourism Queensland. Scurrah will officially begin the role on 25 March 2019 when Borghetti steps down. Hainan Airlines is launching a new year-round direct service from Dublin to Shenzhen later this month. The Chinese airline will operate two flights per week. Shenzhen becomes Dublin Airport’s second destination in mainland China, as Hainan already operates a Dublin - Beijing service. Hainan will operate its new Shenzhen route with a Boeing 787-900 Dreamliner with 289 seats. The route will operate on Mondays and Fridays, beginning 25 February 2019. Qantas has officially cancelled a long-standing order for eight Airbus A380s. In a statement, the Australia flag carrier said: “Following discussions with Airbus, Qantas has now formalised its decision not to take eight additional A380s that were ordered in 2006. Qantas already has 12 A380s in its fleet. In January, Airbus said it was in commercial discussions with Emirates “in relation to its A380 contract” following reports that the airline may cancel all or part of a follow-up order for the superjumbo. Thomas Cook has launched a “strategic review” of its airline, with a potential sale on the cards. In a statement announcing its first quarter financial results, the group said it was at an early stage in the process but plans to consider “all options” to enhance value to shareholders and to invest more in its hotels business. Thomas Cook’s airline currently operates a fleet of 103 aircraft, of which a quarter serve long-haul destinations. For summer 2019, the company said airline bookings are below last year, as we have selectively reduced capacity in short and medium-haul destinations by taking in less wet-lease capacity. Air France has confirmed that its Hop! regional subsidiary is to be rebranded as Air France Hop. It said the rebranding exercise was “the next step in the process of simplifying Air France-KLM’s brand portfolio”. The rebranding of Hop! follows news that Air France plans to close its millennium-focused airline Joon. Meanwhile, Air France is to upgrade its cabins and inflight connectivity on 15 of its Airbus A330s by 2020 as part of a €140m investment. The SkyTeam member’s A330s will be configured with 36 business-class seats, 21 in premium economy and 167 in economy. Norwegian subsidiary Arctic Aviation Assets has agreed to sell two Airbus A320neo aircraft. The aircraft are currently leased out and delivery will take place during February 2019. The transaction is expected to increase the company's liquidity by $26m after repayment of debt. Earlier this year, Norwegian announced plans to divest aircraft, postpone deliveries and end non-profitable routes as it seeks to become profitable. The airline carried more than 2.6 million passengers in January 2019, an increase of 13 percent compared to the same month previous year.